Holiday parties are awesome. (If catching up with friends over a smorgasbord of cookies is wrong, then I don't wanna be right.) Still, big social situations can be awkward at times. Reaching for a drink as social lubricant can become almost a reflex. Unfortunately, it's not the healthiest choice and it's pretty sad to have to rely on alcohol to talk to people. Plus, I don't know about you, but alcohol has made me say some pretty strange things and made me make out with even stranger people. Not good party etiquette. I'm actually kinda shy by nature so when I stopped drinking I totally had to teach myself to be outgoing without booze. Here are some tips and tricks I use to make new friends. If you only do one thing, do this. Who doesn't want to get to know a person who is smiling? Happy people are just more attractive/compelling. If you don't feel like smiling, smile anyway. Studies show that smiling can actually make you happier. Also, sharing a smile with someone is an easy way to help him or her feel happier. Ask people high mileage questions about themselves. High mileage questions are questions that can't be answered with "Yes", "No," or any other single word. A good, and obvious, opening one is "How do you know [the host]?" But don't stop there. When you're a little deeper into conversation try asking: "What are you looking forward to in 2015?" I've noticed that people really appreciate being listened to. (It's a rare treat!). Asking questions beyond the standard "What do you do?" (which sometimes sounds like "How good are you?" and "Are you worth talking to?") is a great way to make a meaningful connection with someone. It also creates the opportunity to learn something. There are lots of great HMQ in this book, which is technically for coaches, but I sprinkle these in conversation when I'm not coaching too. Bring a yummy, interesting, and healthy snack. If you bring something more interesting than a bottle of wine or tub of Sabra to a party people will want to talk to you and they'll remember you too. Homemade snacks are the bomb and if it's good people will be coming up to you for the recipe. If you're really shy, this tip is a must-do. The Blender Girl has a ton of vegan dip recipes pined here. And I think if someone brought this vegan kale & artichoke dip to a party I'd have to marry them. (Sorry Richard.) If you're really crunched for time, just blend some spinach into a tub of store bought hummus and transfer to a bowl. It's our secret. Acknowledge awesomeness! Like someone's ugly Christmas sweater? Enjoy the dip they bought? Dig the way they did the Funky Chicken? Let 'em know! They'll appreciate it and you'll make friends with someone who shares your good taste. Bonus points for complimenting someone's actions instead of their appearance. Also, looking for things to compliment makes you notice the good stuff in life which makes you happier. Hooray! Be sure to be genuine though. Fake compliments are the worst! Thank folks for bringing whatever awesome treat they toted to the party. Thank the host for putting your favorite song on the party playlist. Thank the organizers for making it happen. Thank the people you chatted with for being such good company. Thank yourself for stretching out of your comfort zone and making an effort to be friendly and accept friendship from others. In summary: Love 'em up! The secret to enjoying social situations is remembering that everyone is lovable and wants to be loved. Love yourself and confidently work the room with the knowledge that you're super lovable. Also focus on how you can radiate love and appreciation to everyone you encounter. Make it your intention to project a feeling of love and you'll have the best time ever! For more tips, check out Smart Passive Income Podcast episode 139. Host Pat Flynn interviews Susan RoAne, author of How to Work a Room: The Ultimate Guide to Making Lasting Impressions - In Person and Online. Susan shares a lot of useful and encouraging information and there are some great resources in the show notes. What's your secret to lighting up a room? 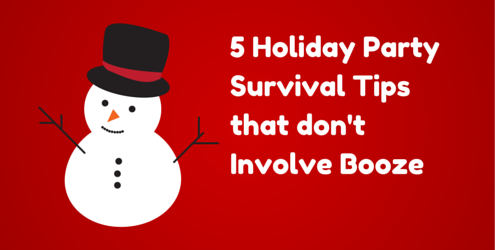 Share some holiday party survival tips in the comments.